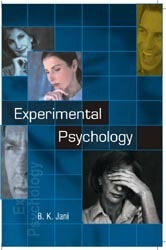 Experimental Psychology is a book meant for practitioners in psychology, teachers, research scholars and students. It covers all the techniques and methods adopted. In the process of psychological evaluation and also discusses the theories that go with them so as to place them in a proper background. It has been written in simple, easy-to-understand language so that beginners too will not find it difficult to grasp the complexities of the subject. The topics covered are wide-ranging and have been made exhaustive and complete in all respects. All the basic theories of experimental psychology have been discussed in detail and the pros and cons explained with all their connotations, Practical examples have been included to make them comprehensive and presented in a concise and lucid style. It is with this intention that the chapters have been devised, which include: •	Understanding Personality Through Expressive Movement •	Using the Szondi Test •	Projective Techniques •	Appraising Personality by the Wechsler-Bellevue Intelligence Scale •	Psychological Tests for Children •	Puppetry in Psychology •	Projection as a Therapeutic Tool •	Role Playing in the Theory of Personality Using Children’s Reactions to Interpret Hostility Patterns •	Bibliography This book will be useful for students, teachers and researchers in Psychology and also the lay reader who is interested in various facts of human behaviour.